Recent Events - Website of inspiritmin! Video clips of recent musical events are housed on the In Spirit YouTube Channel. Please SUBSCRIBE to the channel when you visit so you will be notified of newly-posted videos! Here is a song from our Winter Solstice celebration featuring Karl Anthony. Cincinnati-based musician Jim Feist accompanied Karl on tabla. The last regular First Saturday Chant was a festival of peace and love with The Bead People. Thanks to all the "flower children" who joined us for this special evening, wrapping up more than 7 years of wonderful First Saturday Chant nights. Many thanks also to Videographer Extraordinaire, Michael Taggart, who created this extended video of the event. Charlotte, North Carolina-based singer, songwriter, and minister Christy Snow was our special guest at the Chant in May. Los Angeles-based singer-songwriter Harold Payne was our guest at the April chant. Harold is a multi-platinum and Posi award winning songwriter who has written songs for such diverse artists as Rod Steward, Patti Labelle, the Temptations, and long-time collaborator, Bobby Womack. We were blessed to have Harold join us for the weekend. The amazing singer-songwriter Tom Kimmel was our guest at the Feb. chant. Since 1980 dozens of Tom’s compositions have been recorded by a host of major artists, including Linda Ronstadt, Johnny Cash, Joe Cocker, Art Garfunkel and Randy Travis. They’ve been featured in films from Twins to Serendipity and Runaway Bride, and in television shows from Captain Kangaroo and Touched By An Angel to Dawson’s Creek. An award-winning artist in his own right, he has released seven solo albums, published a book of poems and led songwriting workshops and classes around the country and in Europe. 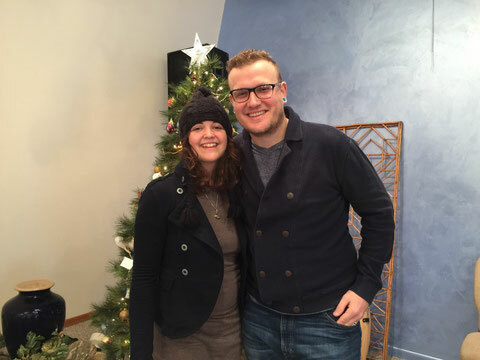 Jesse Powers and Chad Warren helped us kick off the new year right with a wonderful performance at the First Saturday Chant on Jan. 6th, and then a musical visit to Unity of Delaware on Jan. 7th. The December Chant closed out our 7th year of the First Saturday Chant! The Unity Ukes made a special guest appearance. Thanks to all of you who have supported us through the years; we hope to see you all again in the New Year! Jan Garrett and JD Martin were our special guests at the November Chant. 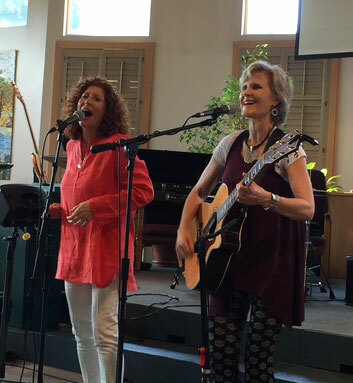 This musical duo from Colorado has inspired positive music songwriters for quite some time, and their songs have won and been nominated for many awards in the Positive Music community. Motown legend and positive music guru Eddie Watkins, Jr. was our special guest at the chant in September. 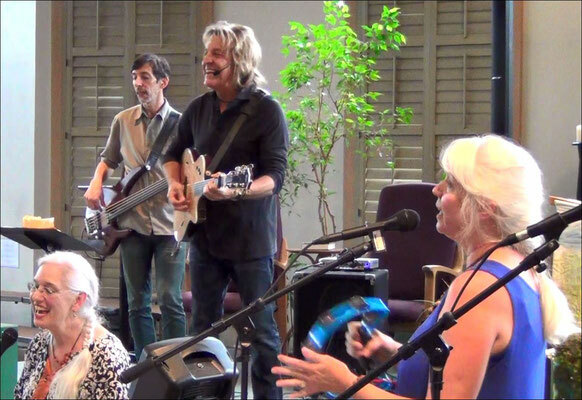 Eddie also performed at a house concert and at the Sunday service at Unity Church of Delaware. Thanks to Michael Taggart for this video, and thanks to Eddie for another memorable visit to the Columbus area. Local sensation Jesse Powers joined us at the chant on August 5. Her energy helped us create a love-filled space that evening. Thanks to Michael Taggart for this video taste of the event. 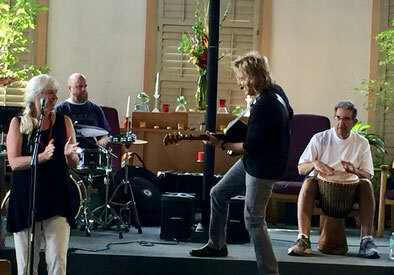 Karen Drucker with the In Spirit Band, June 2017. Left to right: Steve Perakis, Ralph Leeseberg, Lynda McClanahan, Karen Drucker, Joe Lambert, Michael Kontras, Joe Nelson, Joanne Blum. Our special guest at the March Chant was the dynamic Amy Steinberg. 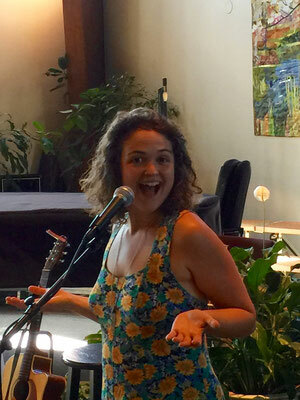 Amy is based in Charlotte, N.C. and dazzled us with a delicious blend of jazz, rock, hip hop, and poetry. Karla Wright was our special guest at the Feb. chant. 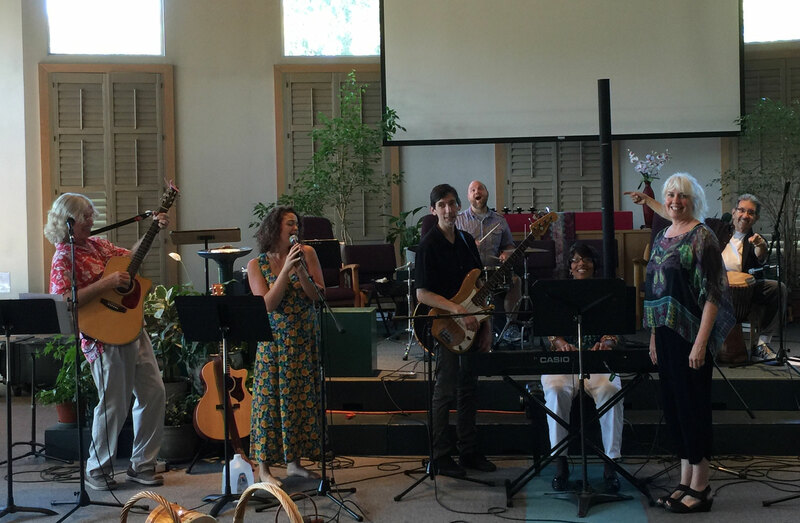 The soulful Joel Knepp also joined the In Spirit Band on guitar and vocals. Video courtesy of Michael Taggart. Kim Belew, a "conscious rapper" from Cincinnati, joined us for the January Chant. Accompanying her was spoken word artist, Angelle Peace. Our thanks, as always, to Michael Taggart, for his videography. 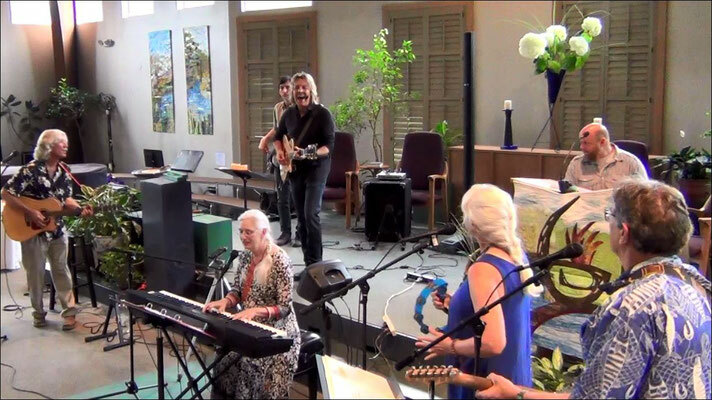 On Dec. 21 San Diego-based musician Karl Anthony presented a laser light mantra event, hosted by In Spirit Ministries. The laser light was stunning, the music heart-stirring, and the fellowship warm and cozy. Thanks to Michael Taggart for this video clip. 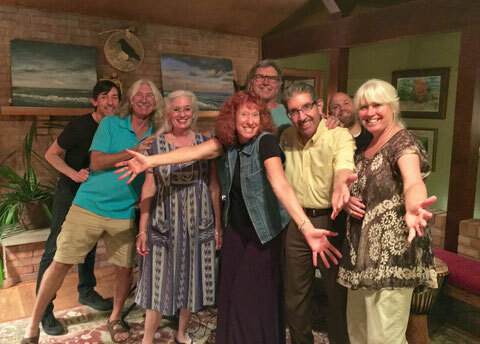 Thanks to all who attended the house concert featuring The Bead People this past weekend. A groovy time was had by all. 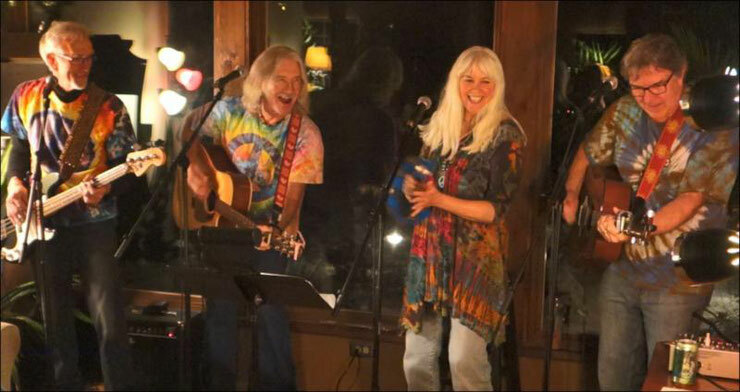 Our thanks to Michael Taggart for the photo above of the aging hippies in action! October With Eddie Watkins, Jr. Thanks to Michael Taggart for putting this fabulous video together for us! January With Eddie Watkins, Jr.
"SHINE" Chant (6 min. clip) with Claudia Carawan. Video by Michael Taggart. In case you missed the April chant, videographer Michael Taggart captured the fun and energy with this video clip. Local singer-songwriter Buzz Fawcett was our special guest. Thanks to everyone who put on their love beads and came out to hear the Bead People at the February Chant. It was heart-warming to see so many folks with flowers in their hair! Many thanks to videographer Michael Taggart for the delightful mini-concert in the clip above. If you weren't able to join us in person, you can catch the spirit of the event in this well-crafted video that runs about 12 minutes. Also, if you'd like a CD of "Bead People Live at the Chant," a limited number are available at a cost of $8.00, which includes shipping. To order, click HERE, or use the navigation bar at the top of the web page and select the In Spirit Store. Eddie Watkins, Jr. was with us at the First Saturday Chant in January to start the new year. This clip by Michael Taggart brings back the joy and energy of he brought to the event. The In Spirit Band always gets fired up with Eddie! Here is a clip of the chant in November with the dynamic, amazing LaJoyce Daniel-Cain. Thanks to Michael Taggart for making this clip. Jan Garrett and JD Martin were our special guests at the chant in October. This clip created by Michael Taggart conveys a taste of this wonderful duo. The In Spirit Band was pleased to be able to perform with Jan and JD on some songs. Thanks to Michael Taggart for this clip of our September chant which focused on peace.